Well, many of the instances that clients believed this to be the case would actually have worked out just fine. If I had to depend only on the big-budget projects for my livelihood I’d probably go broke. The truth is I work for all kinds of clients, big, small and in-between. Many times the most interesting projects are the ones that don’t have the huge budgets. There sometimes seems to be a direct inverse correlation between budget size and creative freedom. Often we can find a way to work something out. 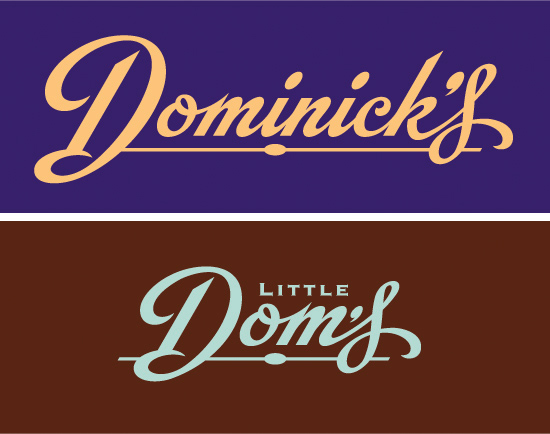 Just as an example, a recent project of mine was to do logos for a pair of Los Angeles restaurants—one in Beverly Hills, the other in the Los Feliz/Silverlake area—Dominick’s and Little Dom’s, two recent additions by restauranteur Warner Ebbink. The budget wasn’t gargantuan, but we were also able to work out a situation where I was able to take advantage of his hospitality in exchange for my design expertise—it was win-win all around. Just my recommendations…color to me is just as important as any of the other elements one has to decide on. I don’t consider it as an afterthought, but as an integral part of any design I work on. The lettering is classic, as are the color schemes. Were the colors already in use or something that you recommended?